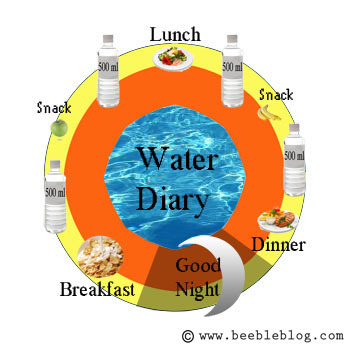 Home Your medical guide	Water – how much should you drink everyday? Water is essential to good health, yet needs vary by individual. Your water needs depend on many factors, including your health, how active you are and where you live. Although no single formula fits everyone, knowing more about your body’s need for fluids will help you estimate how much water to drink each day. It’s generally not a good idea to use thirst alone as a guide for when to drink. By the time you become thirsty, you may already be slightly dehydrated. Further, as you get older your body is less able to sense dehydration and send your brain signals of thirst. On the other hand, excessive thirst and increased urination can be signs of a more serious medical condition. Talk to your doctor if you experience either. If you drink enough fluid so that you rarely feel thirsty and produce 1.5 liters (6.3 cups) or more of colorless or slightly yellow urine a day, your fluid intake is probably adequate. If you’re concerned about your fluid intake, check with your doctor or a registered dietitian. He or she can help you determine the amount of water that’s best for you.